When discussing the approaches to take towards being open to dating, they typically entail setting expectations and addressing your wants and needs out of a relationship. This mentality can at times bring on anxiety, self-doubt, and feelings of desperation. 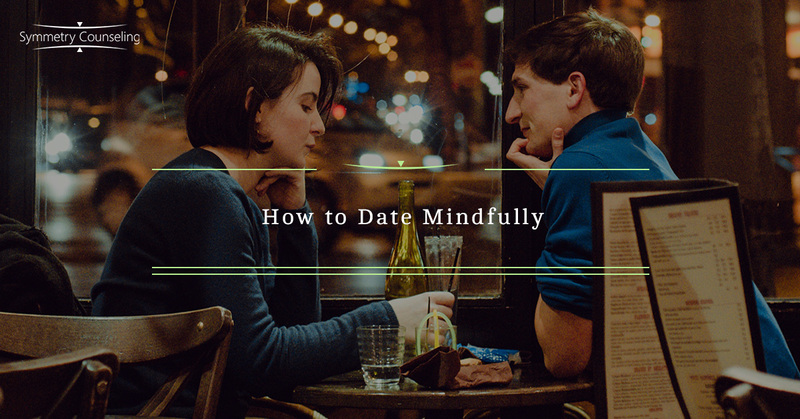 Taking a different type of approach to dating by incorporating the Dialectic Behavior skill of Mindfulness can create a more present moment focus towards patience in the dating process. The main component of mindfulness is keeping a present minded focus and emphasis on one thing at a time. Dating mindfully is exploring more self-acceptance of who you are as a person and who you are attracting. Having a mindful view of dating can also combat a few thinking errors that can occur in the dating process that can overwhelm us with insecurity and doubt. The main thinking errors entail overthinking either too far into the future or getting stuck in the past. Everyone presents with a history of how our beliefs and views of ourselves are created and when we stay focused on the false core belief patterns, it becomes difficult to stay in the moment. False core beliefs can come through the stories we tell ourselves or the negative traits we have false reason to believe from our past circumstances. These are common phrases such as: “it’s all my fault,” “there is something wrong with me,” and “I am not capable of love.” Over time, the perceived letdown of dating creates this false sense that these stories are real to us. To combat this form of thinking, work on controlling your mindset to be more present-focused. This is where self-compassion skills come in to emphasize more on your present qualities and self-knowledge. Work to incorporate more realistic self-talk and see yourself as your own cheerleader to combat the negative associations and create a positive outlook on dating. The other thinking error in dating comes in the form of fantasizing, creating a fallacy and a misrepresentation of the reality of dating. This type of thinking error opens the doors to the notion of “fantasy land” where you are seeing a clouded view of how you feel and think of a relationship and/or the person you are dating. The risk is in believing where your mind has wandered, creating a false sense of hope and overlooking the characteristics that do not align with your core value system. In combating this thinking error, we want to be mindful of our attachments or demands in relationships. Too often, we try to mold people into what we want them to be rather than honoring them as they are. Anxiety can start to develop from feelings of desperation and setting unrealistic expectations within this thinking error. Mindful thinking patterns develop through meditation to focus on being present and noting how one is feeling in the current moment. This can help towards combating false core beliefs that we have developed and maintained through our stories that create limits on how to feel free to be open to another person. Mindful thinking helps to focus on self-compassion and self-acceptance in wanting to be kind to yourself and trust your personal timeline. When we stay more present-minded focused, there is less pressure put on your timeline and more optimism that everything will work out for you. Dating is hard and challenging to begin with, so why not focus on what you can control in the dating game? That is how you view dating through your mindset. The mindful approach is keeping you focused on how you are feeling, your thoughts in the present, and providing energy to attract what you really want. A great resource tool to explore on this topic is “If the Buddha dated, a handbook for finding love on a Spiritual Path,” by Charlotte Kasl, Ph.D.